It's currently 5am. I've been awake for two hours since Big Boy called out "Anyone? Help!" which is three year old speak for "I appear to have been sick in my bed, could someone come and clean it up and at the same time comfort me?". With Big Boys room out of action until everything smells better we have decamped to the living room where cuddling up on the sofa is mandatory and watching cartoons together is a necessity. Even in this Modern Day World of 24hour Children's TV you can't guarantee that there is something suitable for a sick three year old to watch and so you normally have to turn to your pile of DVD's which lucky for me has recently been restocked with a pile of DVD's kindly sent by Warner Brothers. 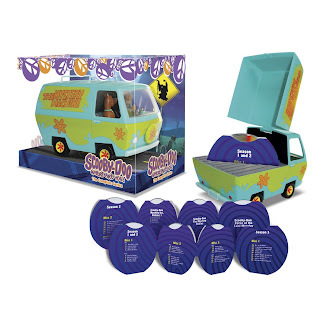 The DVD's feature some of my favourite characters from my childhood and Big Boy and I are making our way through a box set of Scooby Doo. Now if you don't mind whilst Big Boy is wrapped up in working out just which of the suspicious townspeople is the one in the monster costume I'm going to see if I can catch a sneaky forty winks and when I wake up I think we might be be ready for another DVD. Anyone else want to join us? Just in case it wasn't clear we got a stack of DVD's from Warner Brothers which have come in handy now that Big Boy is laying on the sofa feeling sorry for himself. Not that you would know looking at the picture of him smiling whilst cuddled up to me!